Enter the amazing and wonderful world of gourmet grilled cheese where diets and new year resolutions come to die, GCDC Bar near White House in Washington DC. OMG OMG OMG is really the only thing we kept saying as we were waiting for our table with pure excitement. I mean, how can you not be excited like a little kid when you about to eat at Grilled Cheese Bar. As soon as you enter all you smell is the amazing grilled cheese. We came here for dinner so sadly the make your own grilled cheese was not available, that is only done during lunch time. After just one visit we became big fans and can totally come back here every week, after all, no one needs arteries! This is also a full bar with lots of very tasty alcohol drinks. So really a kid place for adults! 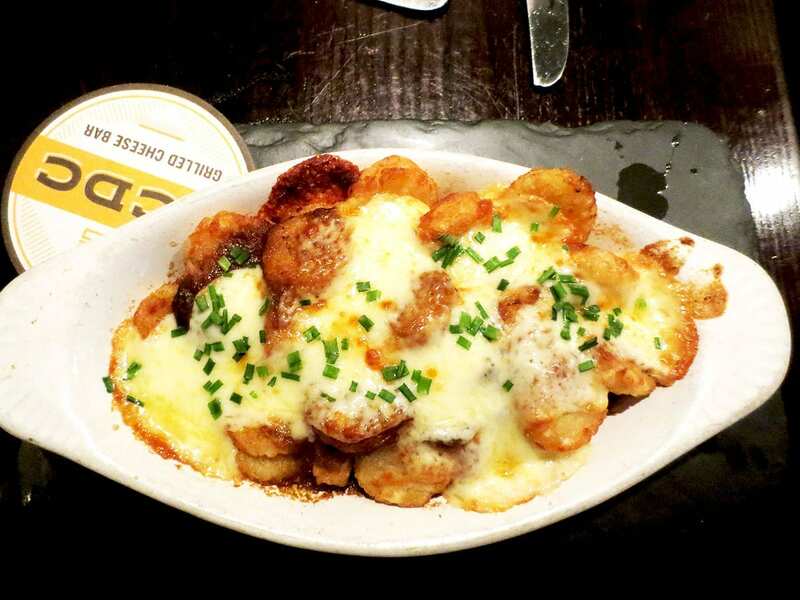 You haven’t had tater tots until you had them as Poutine from GCDC Bar. Poutine is all the rage right now in DC with several new places opening up tailored just for this. This grilled cheese bar definitely stands strong with this order. This thing is a sight of beauty, with cheese curds, gravy, mushroom, bacon, and a whole lot of cheese. The first thing we noticed is that tots didn’t really look like what we are used to, but taste just as good. The second thing was how omg cheesy good this was. They know their cheese so they are very generous with the gooey goodness. Every bite was just pure joy and made us very happy nomster. We were quite hungry and started with few drinks while waiting for our grilled cheese. So this was a perfect starter to share. Wouldn’t recommend, more like advice against trying to finish this all by yourself. Such a heavy dish that two of felt stuffed when our grilled cheese arrived. Two fun fact, tots can be gluten free upon request and made vegetarian by dropping the bacon. Price wise this was a good order for just $11. 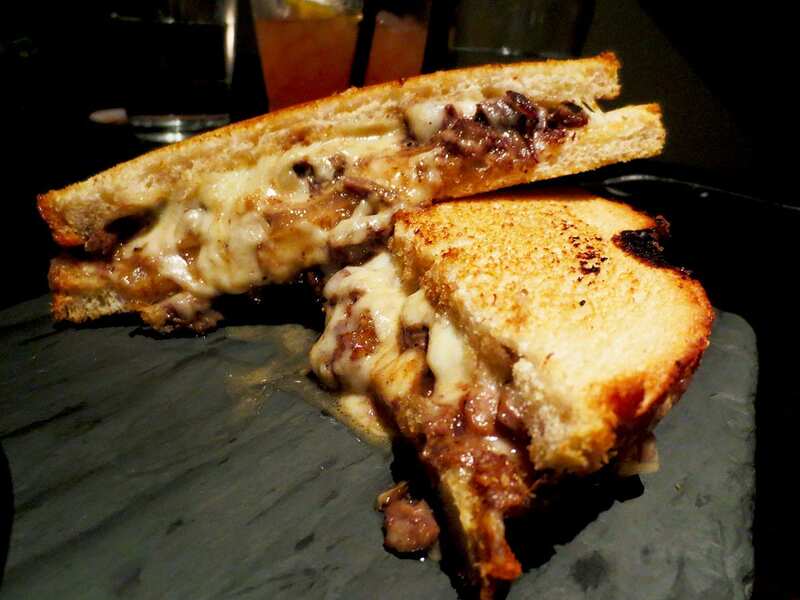 I like my grilled cheese how I like my man big and gooey all over, just like The Short Rib Grilled Cheese amazingness from GCDC Bar. The theme of dinner is the whole lot of cheese, and really nothing else because we are about to bite into most amazing grilled cheese ever. Everything about this dish was simply perfect. The first bite in the warm cheesy just surrounds your mouth and gives you pure joy. Bread was grilled to perfection with a bit of crunch and yet soft. This could be the most perfect grilled cheese we’ve ever tasted. Served on a side with horseradish which added a very nice kick to every bite. It also comes with your choice of a side and we could have ordered more tater tots as the side but opted out for a salad as a very tiny attempt of making this dinner healthy-ish LOL JK. This is one of that dinner you might need a very long nap afterward and maybe a week of the gym to work off. Who cares, it totally worth it! Skinny never tasted this good. When are we going back?